My office took Monday the 2nd off so we would have a long weekend, so we are actually working today. I expect it to be a very quiet day with minimal phone calls and emails, so perhaps I can get MUCH done! Oh, what did I do with the rest of my life in June? I forgot a few little incident/anecdotes from early in the month. I went back and checked through my Facebook page, that helps. From early in the month: Ken said, “By the way, nice drawing this morning.” I had drawn him an arrow on a paper towel to point out the cat barf on the kitchen rug. The barf kind of matched the rug so I barely saw it in time and didn’t want him to step in it. It is not every morning that I am coherent enough to draw an arrow. I wasn’t going to clean up the cat barf, but I didn’t want him to step in it. The TSA lady at the Bozeman airport needed to pat down my collarbone area because of sequins on my shirt the security scan found alarming. She asked me if I had any bruises around my neck (presumably so she wouldn’t hurt me.) I said, “Nope, no recent vampire bites either.” Someday I am going to get into big trouble at an airport, I just know it. And, I am glad to report that we only had BBQ beef on a bun ONCE during all of the meetings out in the fields. That was partially due to some planning on my part, but part luck. We did have various other kinds of barbecue, such as brisket, and pulled pork sandwiches (but sliced, not sauced) but those were an excellent and a welcome variation. The last meal of the trip was a Mexican buffet which was quite good, excellent green chile. And I thought it was hot while we were out there (these meetings were all outside) but it got much hotter after that week – so I am grateful it was only in the 80s and 90s that week, not the 100s like the following week. It was, however, very windy, and each night I left a significant of Colorado dust in the bathtub, especially since I was rigorous about re-coating myself with sunscreen, so the dust had something to stick to. 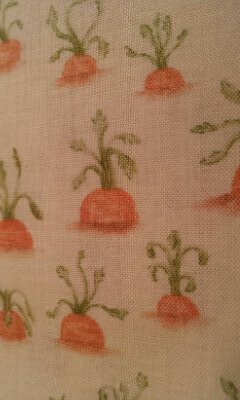 I went out shopping yesterday for setting fabric for the bunny rabbit embroidered quilt. Was all set to get purple and pink, because I know pink is one of the niece’s favorite colors. 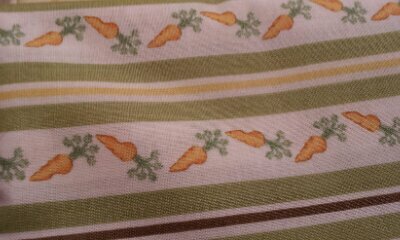 Then I happened upon some carrot fabric – how perfect is that for a bunny quilt? So I hope she likes it. This quilt was meant to be done when she was a baby, and she is going to get it when she turns 5 in October, so I am making it into more of a twin size quilt. That is what I get for picking a quilt with 12 blocks, the next one will have six blocks, which is what I typically do. 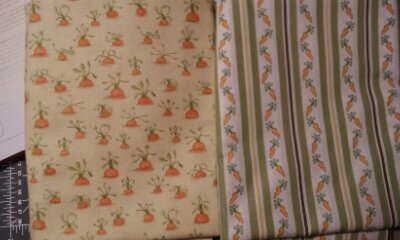 The Sewing Circle, a quilting store in Fort Collins, was having a Buy 2 Get 1 Free special, so by buying two yards of each of the bunny fabrics, then I got 2 yards of strawberry fabric for free. 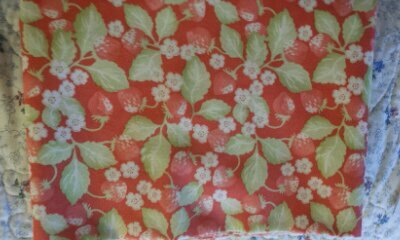 Not sure what I am going to do with it yet, but I am building quite a collection of strawberry fabric. My poor garden is about fried. It did not need record setting heat in June. My little pumpkin plants have flowers on them, but the plants are so tiny, I doubt they are going to do anything. Only about 3 little lettuce plants came up. I am tempted to turn the top part of the garden into just peonies, bleeding hearts, and herbs. Trying to get more herbs that will re-seed themselves or just come back from the roots. Thyme and mint doing pretty well at it. Cilantro re-seeds itself and then bolts almost immediately. Haven’t been able to get dill started. Tried to move the horseradish and chives, and they just died instead. This entry was posted in Crafting, Garden by glenderella. Bookmark the permalink.